Spanish sculptor, son of Alonso de Mena, also a sculptor. He studied with his father and followed his style in the early part of his career. After the death of his father, he worked with Bernardo de Mora, who had moved to Granada in 1650. The arrival of Alonso Cano in 1652, however, caused a change in Mena s artistic direction; he and Mora began to collaborate directly with Cano, and this close working relationship left a permanent mark on both of the younger artists styles. 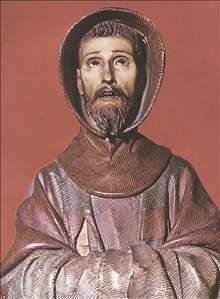 Mena s first important works are based on figures by Cano, who had been commissioned to produce four sculptures for the convent of the Angel Custodio: St Anthony of Padua, St Diego of Alcal, St Peter of Alcntara and St Joseph (all 165657; Granada, Alhambra). These were executed by Mena, who managed to gain Cano s trust and to earn a significant place for himself among Granada s makers of religious images. He remained a sought-after sculptor in the city until 1658, when he was commissioned by Bishop Diego Martnez de Zarzosa and the Mlaga chapter of the cathedral to complete the choir-stalls there that had been begun in the 1630s by Luis Ortiz de Vargas (fl 162947). The contract required that Mena live in the city for two years and called for 40 panels to be carved with reliefs of saints, and for carving to be done on the edges of the stalls. He therefore left Granada and moved permanently to Mlaga. As he worked on the figures of the saints, which were essentially relief sculptures attached to the panels, he made a notable effort to introduce the greatest possible variety in their treatment by emphasizing their characteristic attributes while allowing the background to remain flat. In Mlaga, the abundance of commissions forced him more and more to rely on workshop production, tending to production line formulas in which, nonetheless, quality was never compromised and there were even still some masterpieces. His fame as a great artist, of which he showed his pride by signing many works, allowed him to attract a famous clientele, a comfortable life and distinctions such as his appointment as sculptor of the Cathedral in Toledo. The statue of Saint Peter of Alcntara (Museo Nacional de Escultura, Valladolid) is dated around 1663, and represents the Carmelite saint when receiving divine inspiration, his arms raised as if holding up quill and book, now missing. The bust of Ecce Homo, a work designed to be observed close up, impresses with its static pathos. One of the original creations by Mena that has been most often repeated and published is his bust of the Mater Dolorosa, characterized by a delicate face with a mournful expression framed by a cape and veil of extremely fine edges, somewhat raised glass eyes, reddened eyelids, tears streaming down her cheeks and a small, half-open mouth.